Now That’s a Teeter Totter! I don’t know where or when this photo was taken, but this is how they used to do it in Minneapolis parks. This is how above-average kids used to play. Kid-powered thrill rides provided the adrenaline rush. And there isn’t a single teeter-totter crash helmet in sight — unless that girl has padding in her bow. I’ve read every Attorney’s Report in park board annual reports, as well as all attorney reports in park board proceedings since 1904, when playground quipment was first installed in Minneapolis parks, and I don’t recall seeing even one report of a lawsuit over injuries on teeter-totters—or any other playground apparatus. Maybe there were no injuries and it was simply the fear of injuries that caused the teeter-totters to be taken down—or scaled down. It’s been years since I’ve seen one. Do they still exist? Compare this to the two newest playgrounds in Minneapolis parks at Beard Plaisance and William Berry Park near the Lake Harriet Bandstand. Nice, and big improvements, but pretty tame. My favorite playground equipment is still the stuff at Brackett. First they had the Rocket, and now they have innovative equipment that’s quite unlike other parks. More importantly, how did moms keep those dresses so white? If you recognize the location above, or can guess the year, please send a note. This photograph looks like it could be Minnehaha Park. It had a long row of teeter totters, and a large number of swings. Also, it was very flat in the playground area. Thanks for confirming my memory of the name “Brackett Field.” What happened to all of the “Field” names? I enjoyed going to Perkins Field way back when…partially taken by the freeway. Webber Park was wonderful in the 1950s and 1960s, with its cozy, old fashioned library, running creek, and huge public pool. It’s only a shadow of itself now. I hear the library is moving away from the park. Too bad. Thanks for reminiscing, Wendy. All the “field” names still exist officially. In the early 1900s it was a way to distinguish parks that were meant primarily for active recreation and athletic fields — which was a new use of parks. Wendy can you tell us more about Perkins Hill, which was shrunk by I-94. It still provides a great view of the city. And I think you could be right about the teeter totters being at Minnehaha Park. That was one of my guesses too. I grew up in the McKinley neighborhood. My neighborhood friends and I had lots of park options (Perkins, Folwell, Farview, Webber), but the closest was Perkins Field. Before I-94 took out the neighborhood, Perkins Field was quite large and seemed like a world away, maybe because it was high on the river bluff, isolated from nearby houses with a grove of cottonwood trees, some sand, playground equipment and a large field. It was kind of “plain jane” but we really liked the large merry-go-round, and of course the teeter totters. In the summer it seemed magical to us that you could show up and do free crafts with the park staff, and then take the treasures home to our mothers. In the winter we hauled our ice skates up the steep sidewalks to Perkins and used the warming house for shelter to switch from our boots. Then after skating we could warm up by the potbellied wood stove. Again, magically it seemed, free hot cocoa was provided by the attendant after skating. The parks really enriched all of us. Each park was different, and offered different things. Some were farther, but were worth the walk. Fun for kids to have such choices! When the neighborhood ‘gang’ decided to head to Webber it was quite a hike, but we prepared by bringing a picnic lunch, our swimsuits for the great pool, and always did some sort of crazy stunt in the creek, crossing the rushing water jumping from stone to stone, fed the ducks in the pond, maybe borrowed a library book, and then hiked home exhausted and happy. I always thought Perkins Field was named after Frances Perkins (of the Roosevelt administration), but I noticed on another posting that you say it was named for the Perkins Addition property name. Do you know who Perkins was? Thanks for the great description, Wendy. As for Perkins, I don’t have any more information than I included in the profile of Perkins Hill on the park board’s website. I’ll look into Frances Perkins more though. Thanks for the suggestion. 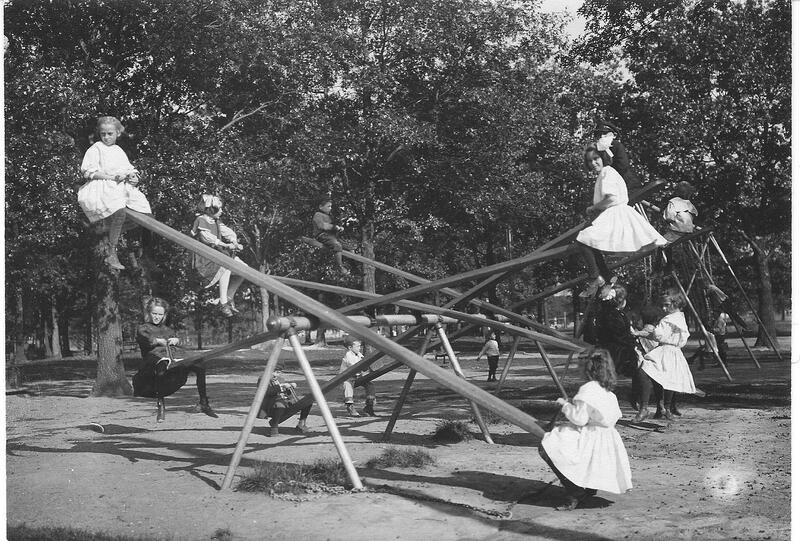 Park Planning staff are trying to recapture some of this old style play as part of the renovation of the playgrounds in Minnehaha Park. Look on the MPRB website for concepts and a public open house in later October! Thanks for the news, Andrea. I’ll have a look.